Having spent some relaxation time on the beach beneath a rather lovely palm tree, it was time to leave when the local youth started ripping up the beach with their beach buggies. I'd cycled that morning from Doha to Al Ruwais - 125km - and I was planning to spend some time in an isolated spot to watch the sunset and stargaze for a while before cycling back to Doha. 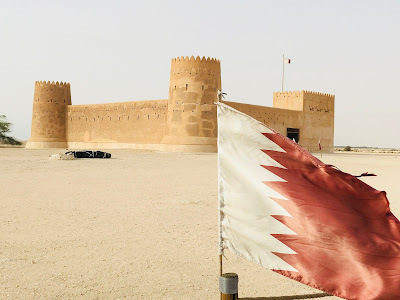 So I set off on the road between Al Ruwais and Al Zubara - an old fishing settlement with a Fort which was built in the 1930s to look out for various invaders from the Turks and Omanis to the Bahrainis and the British. 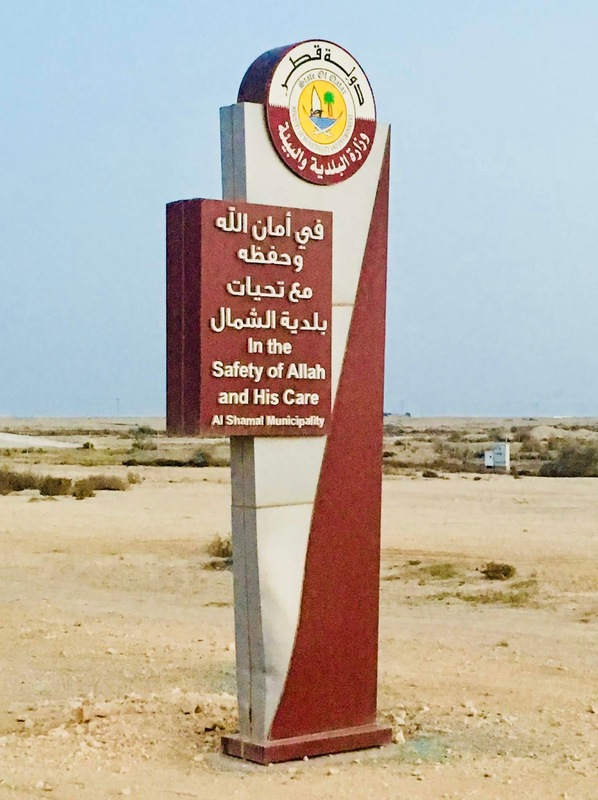 The road ran through the desert and was two-way, single track with no hard shoulder or space for a cyclist, which made me a little nervous, given that drivers here are..... lets just say..... not so careful around cyclists. I was looking for a place to come off the road and head to the sea to sit alone and contemplate. Id been riding for maybe 10 minutes when I saw a vehicle driving in the opposite lane towards me...... no problem. 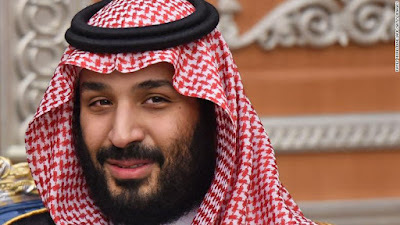 Then from behind him, a Toyota pick up truck appeared and began an overtaking manoeuvre at some crazy speed - must have been over 120 kmph - heading straight for me on my side of the road...... problem. I had no hard shoulder, no space, no time to think.... so a split second decision caused me to jump off the tarmac and into the dust to avoid him.... with a hair's breadth to spare. My trusty steed thankfully remained upright and we skidded to a halt a few metres off the road, kicking up the dust. And I melted into tears and sobs of shock. I tried to carry on few a few hundred yards but had to stop. I stood stunned, shaken and indecisive. What to do now? The sun was dropping, light fading and it was a Friday night when crazy drivers become insane.... not a great combination on a single track road with no space for me. 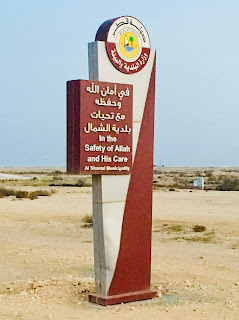 I decided to turn around and cycle back to Al Ruwais and from there I would start the ride home on the highway and find somewhere en-route to watch the stars for a while, passing this sign which reads "In the safety of Allah and his care"!! How appropriate. Still in shock at the close call, I decided to do the only thing an English girl can do in such a situation....... have a nice cup of tea!! I stopped at the 'Tea Time' shop on the edge of Al Ruwais where the best Karak tea is served. 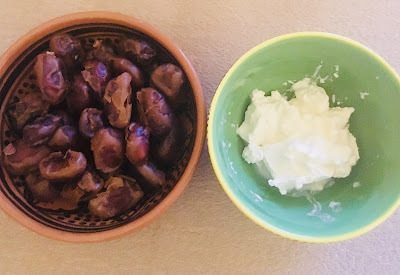 It was hot and sweet and perfect for the moment. 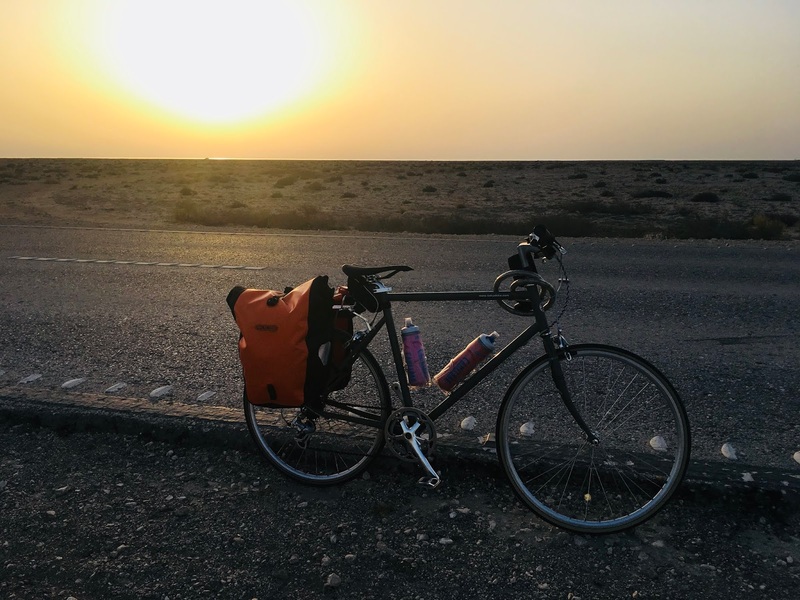 Feeling much better and really excited to start the journey back, I set off at 6pm, just as the sun was finally disappearing. 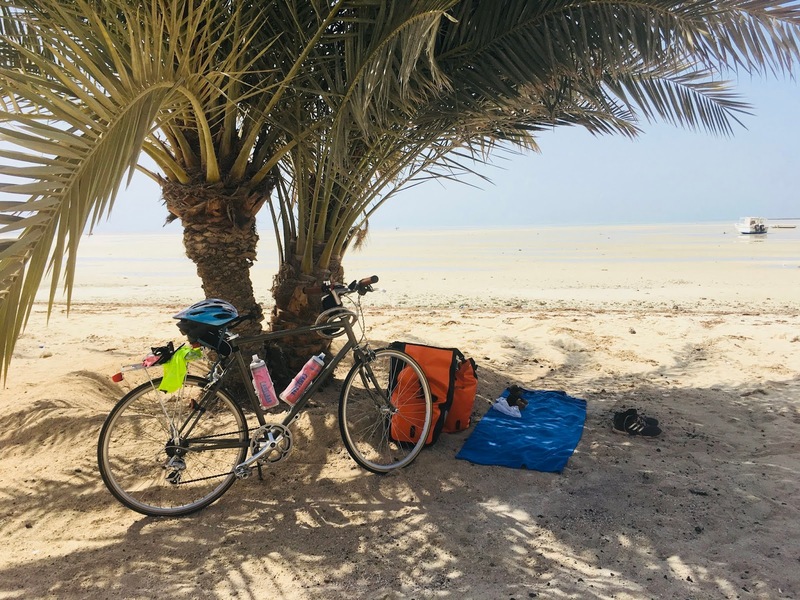 I cycled for an hour along the Shamal road until I reached the turn off for Fuwairit, a popular beach destination. Unfortunately, this too was a single track road and by now it was pitch dark so I angled my headlight to try and watch for any potholes. When the drivers came towards me, their lights blinded me, so I didn't go too far before I settled on a place to stop just off the road. As I wheeled my bike, I almost walked on what seemed to be a grave... a long narrow pile of stones! I apologised to the occupant and moved on. I parked up, made my camp and lit my area with a red light which had a nice glow. 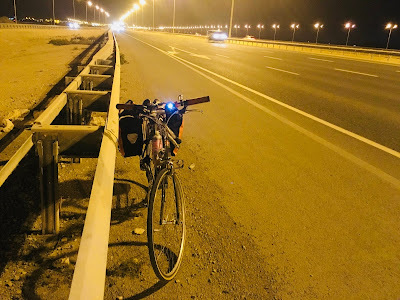 Unfortunately, this attracted rather alot of attention from passing Qataris who drove off the road towards me and offered help. "Whats the problem? Have you had an accident? What are you doing here? Why are you doing this? Do you need anything? Surely I can give you something.... water.... food...?" At least half a dozen cars stopped, before I decided to put out my light and keep as still as possible to find the peace I'd sought and lay back and watch the stars. 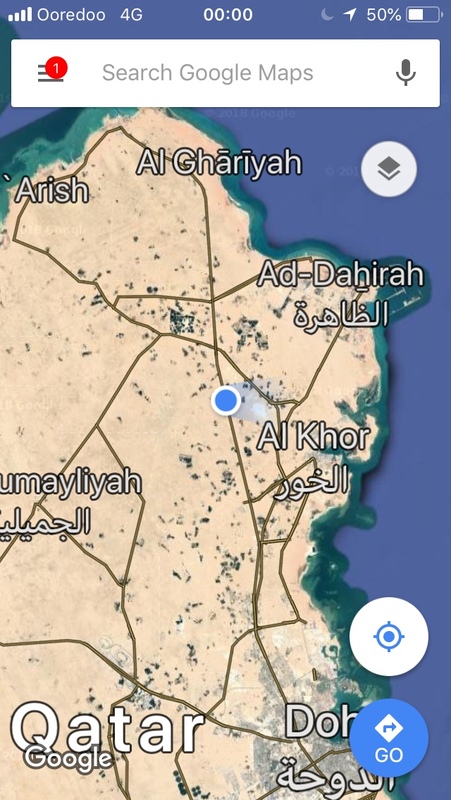 Sadly, though, attempting to stargaze in Qatar is a fools errand. Qatar is quite small and what country there is has been either industrialised by Gas and Petroleum plants or is being stitched together by a new network of multi-lane highways, metros, under and overpasses - all with bright lights. 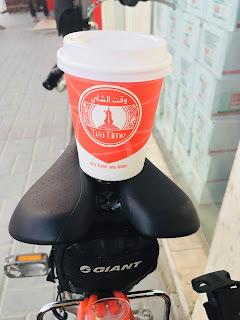 After a couple of hours and starting to feel cold, I decided to get back on the road, stopping briefly at another Woqod petrol station for a hot coffee and a refill of water bottles and a well needed comfort break. 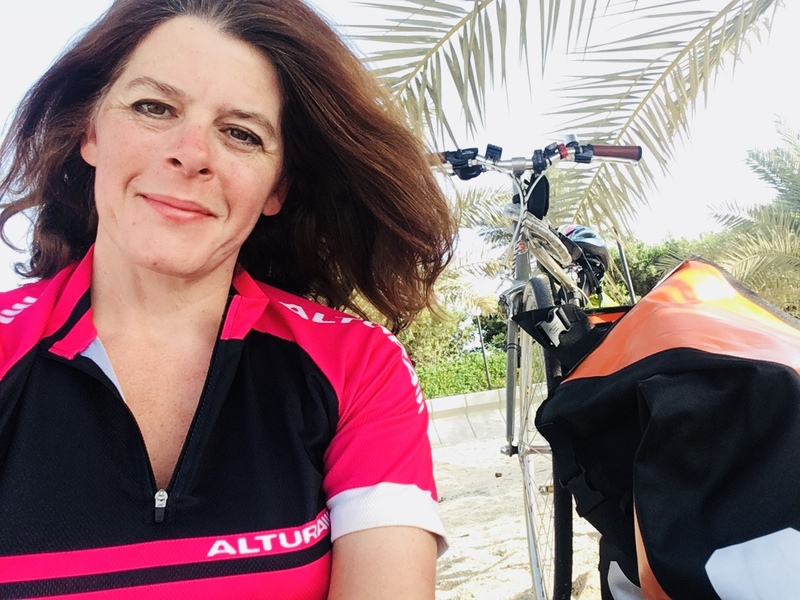 Getting back on the bike was becoming an agonising experience, as if sitting on razor blades.... but pressing on was the only option with a 6 hour ride ahead. It felt good to get going again, despite the fact that I'd now been awake for 18 hours. 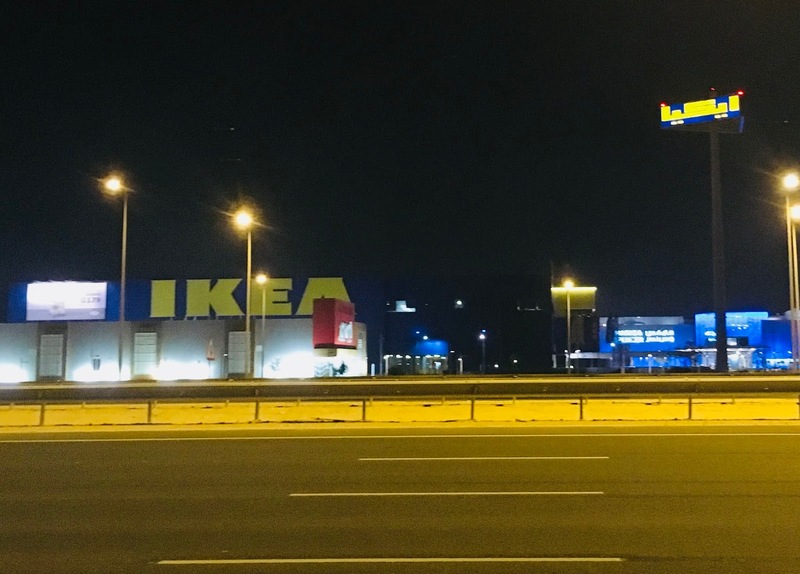 I calculated that with a 10 minute stop every half an hour to manage my back pain, I was looking at an arrival time of approximately 4am..... perfect to avoid the Friday night crazy driving time between midnight and 3am. With every 30 minute stretch, I became more and more desperate for the stop, my buttocks screaming in pain and my back and legs tightening, and with each stop, a routine..... check my mileage, location, time, drink laban, eat figs or dates, stretch. After about 4 hours, the routine had switched to scream as I lifted my buttocks off the saddle, stretch, pray, drink and wonder if I could make it home. 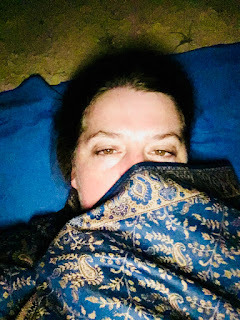 I was checking in with a friend who stayed awake in case I got into trouble but I was determined not to give up, whatever the pain. 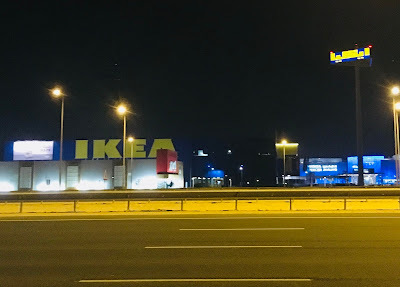 Passing Doha Festival City Mall and IKEA was a major milestone and a sign that I was close to home.... about an hour or so away. At this point I decided that stopping was no longer an option and I would push for home, negotiating multilayer roundabouts, major junctions and scary overpasses which, during normal daytime hours, are terrifying to negotiate by car, let alone on a bike!! Thankfully the roads were at last relatively quiet and I made my final push. 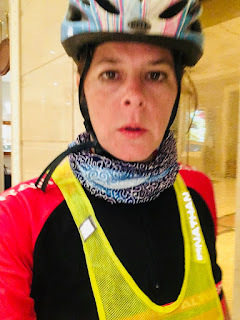 As I got closer to my hotel, I realised that I needed a plan for how to stop, prise my body from the saddle and dismount without screaming in front of the porter. 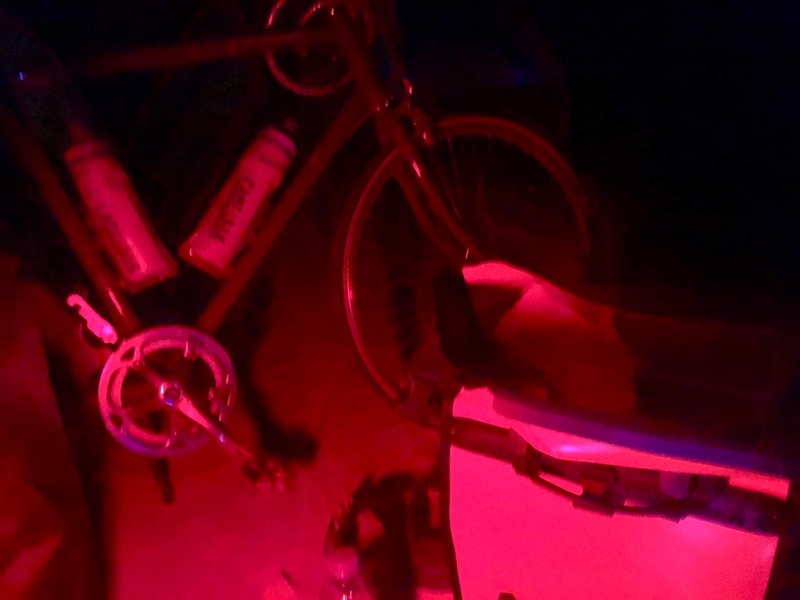 So a few hundred yards away, I slowly and gently rose onto my feet and lifted my bottom off the razor blades that had become my saddle, wincing quietly as I did so. I attempted a smile but the look of horror on his face as I limped stiffly towards the door, looking shell-shocked said it all. "Are you OK madam?"...... "Yes I'm fine.... I've just cycled from Al Ruwais"..... He paused and said casually..."that's quite a long way".....!! 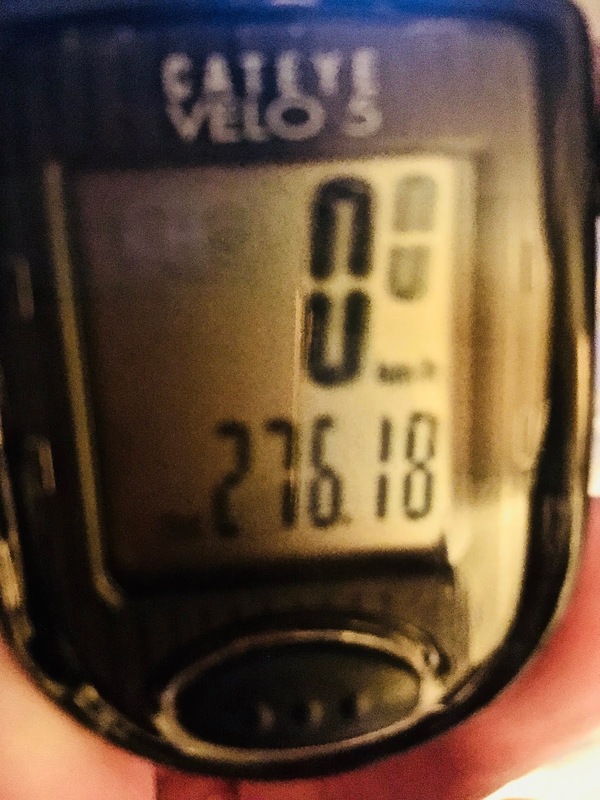 As I walked into the lobby, I glanced at my watch and realised that I had made it back exactly 24 hours after leaving, after a round trip of 276kms. Battered and bruised but just about in one piece. Hahaha ! I love it. Great suggestion.... but in the end its all about the pain. "Man cannot remake himself without suffering.."